Over the last couple years we’ve become ardent devotees to the concept of “Occam’s Razor,” the tenet that the “simplest explanation is most likely the correct one.” There’s a similar paradigm that works itself into any season of Survivor, but focuses less on the simplest explanation and more on the theory that players will make their moves based on the belief that the other competitors will make the correct, smartest decisions. Unfortunately, as the show as often proved, playing that way does not always lead to the best results. And we saw an example of this again last night. But more on that later. First, (as teased last week) Matt arrives on Redemption Island and Francesca is shocked (shocked!) 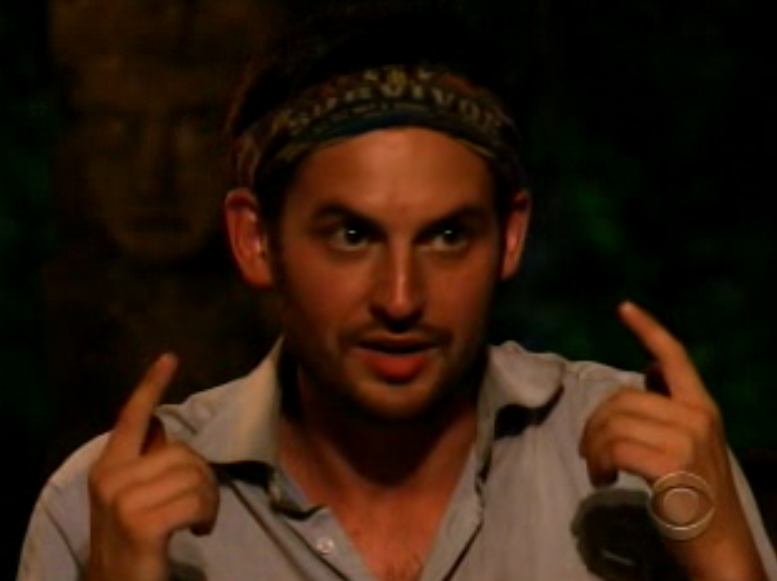 it wasn’t Phillip who was voted out by the Ometepe tribe earlier in the night. He had no allies, posed no threat, and basically begged for mercy, so why would Ometepe (and its leader, Boston Rob) want to keep him around? Oh, yeah, for those very reasons. Phillip may be a loose cannon, intolerable, and borderline bipolar, but right now, as Rob says, he’s a loyal solider. Plus, he’s endlessly entertaining. Back at Ometepe camp Rob breaks down the alliance, explicitly telling Phil that he’s the fifth person on a five-person alliance and Phil is basically responds “Cool! Just happy to be here! Thanks, Rob!” And then they seal Phil’s blind allegiance with a first bump, which in the three federal agencies that Phil used to serve in is tantamount to swearing on one’s parents’ graves. The next day we finally (finally!) have our first one-on-one, mano-a-femano duel on Redemption Island. The winner gets to keep living in squalor, subsisting off three square meals of rice a day, and the loser is executed (or goes back to the resort for a shower and a buffet dinner). 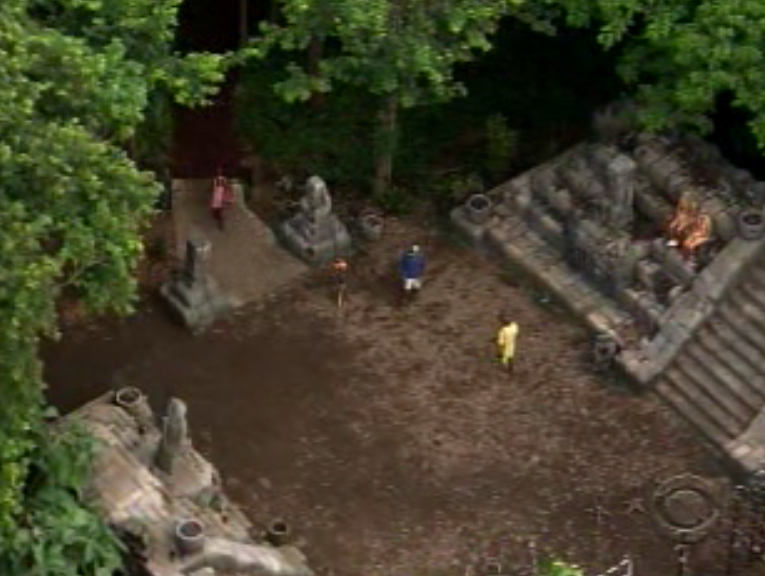 But while the competition is just between Matt and Francesca, Jeff Probst was nice enough to extend invitations to two players from each tribe, as decided by the ol’ blind rock pull. So Steve and David draw the colored rocks for Zapatera, and Andrea and Ashley (still can’t tell you two apart) attend the affair for Ometepe. And, boy, was Andrea ever excited to see Matt, after feeling just HORRIBLE that he was blindsided at the previous Tribal Council. Of course, if she felt so bad she could have at least brought Matt’s stuff with her, as he neglected to pack up before heading to Council the night before. But she was clearly too overcome with anticipation to think of that. And too fixated on rekindling her alliance with a player who likely will be going home in the next week. Because that’s how you win Survivor, Andrea, aligning with the loser’s bracket. Before the duel, a classic jailbreak scenario in which each player needs to pick up a series of keyrings with a long stick, Francesca says that she wishes Matt the best in life, and that she hopes that one day perhaps they’ll have a meal at The Outback, because she’s grown quite fond of that place, but at that moment she wants him to die like a dog. And, after a subdued starting call from Probst, Francesca just crushed Matt (seriously, what was wrong with Probst? How early in the morning did they shoot this? Did someone not get him his coffee? The dude was barely above a whisper. Perhaps he’s just not into you, new Redemption Island format). That is, she crushed him until she couldn’t secure the third and final key. Then Matt, overcoming all of Probst’s comments about his shaft breaking, being too short, not being long enough, etc. (next time this guy can help), came back and earned the victory, sending Francesca out of the game for reals. Then we find out it’s no longer enough to just get your torch snuffed, now you also have your buff burned (the next logical step: snuffing the buff). Goodbye again, Francesca! (We also thought it was interesting that there seemed to be plenty of room for spectators around the Redemption Island Colosseum. There were only four bloodthirsty fans this week, but our guess is that number might increase, perhaps exponentially, in the weeks to come). Steve and David return to Zapatera with the tale of Redemption Island, except that on the way Steve tells us that he’s going to lie to Russell and say that Francesca won, because that would somehow throw off Russell’s strategy. Steve comes through on his promise, offering the fabrication to the tribe, but by saying that “the black chick” won, which was weird because he clearly just said “Francesca” not five seconds earlier. Is that how you act natural, Steve? You think that’ll convince Russell? Not cool man. We have our eye on you. However, Russell’s not fazed by the (fake) news. But that’s because he’s too busy futilely looking for the Immunity Idol that Ralph already has. Oh, Russell. Buddy. It hurts us to see you like this. Looking high and low for an Idol that doesn’t exist, while Ralph looks on, grinning like a pig in mud. Or like a Ralph in mud. Stephanie’s suggestion? Craft a fake Idol, put it in her bag, and then hold onto the bag like it was a newborn baby made out of diamonds. Which fooled approximately no one, and only served to make Russell look weaker and more desperate. Making Russell look even worse? The hideous, nauseating, leaking rashes dotting each of his armpits. Apparently Russell decided to Nair all his body hair before the season, and his underarms have not taken kindly the Nicaraguan jungle (and, no, this is not why we brought up Occam’s Razor). Either that or all the bed bugs have migrated from New York City (we hope) to Central America. Whichever it is, Russell wasn’t wining any points with his gross, rank, inflamed pores. And so the majority Zapatera alliance decided to throw the challenge in order to oust Russell and his nasty pits. Luckily it was last season’s Spin Cycle challenge, Survivor‘s very own version of water torture, which is a somewhat easier, at least less obvious, challenge to take a dive on. The Zapatera six – Ralph, David, Steve, Sarita, Mike, and Julie – do a good job of putting in a convincing, earnest effort. That is until they get to the second part of the challenge, the labyrinth puzzle, where David basically just takes a nap instead of believably attempting the puzzle. Not that it would have mattered if he actually tried. Boston Rob had a huge lead starting the puzzle, and, well, Boston Rob is unnaturally awesome at puzzles, so this was basically a good time to get up and make a sandwich (or reheat some pizza, as we did). So Ometepe “earns” their first win and starts to build some momentum. Meanwhile, Russell figures out that his tribe threw in the towel and thus knows he’ll be on the chopping block at Tribal Council. And we know that things are about to get interesting. Oh, boy, I'm really trying to figure out this puzzle. But it's just SO HARD! (Another point of interest: if they’re going to only compete in one hybrid reward/immunity challenge per episode does that mean a player can still sit out two challenges in a row? In seasons past (we’re looking at you, Sugar), players were allowed to ride the bench for back-to-back challenges, as long as there was a Tribal Council in between. If that’s still the case a weak player, like Sarita or Ashley (we assume she’s terrible), can go weeks without competing. We’ll be keeping an eye on this). 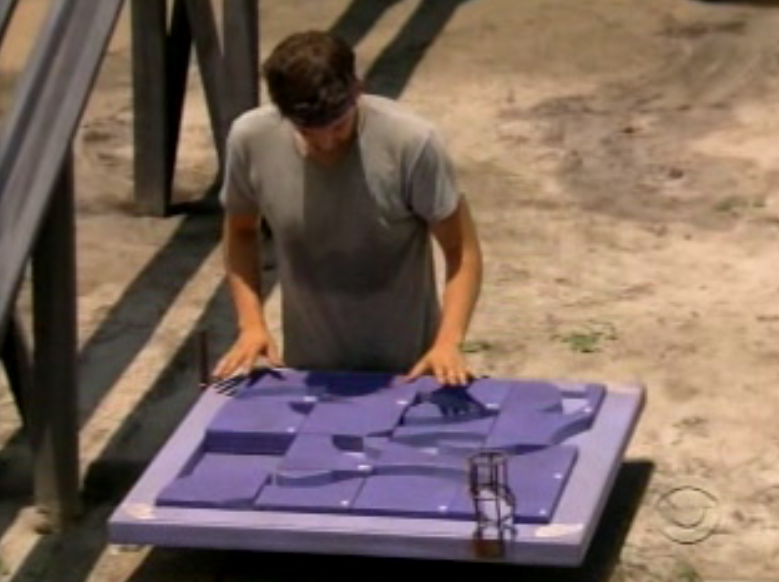 But before Russell can start his scheming, Rob takes out a different page from Russell’s playbook and scours Ometepe’s reward items – various supplies including a tarp, a lantern and beach chairs (obvi) – for an Immunity Idol clue. But he comes up empty. Until he notices something askew with the chair Phillip is reclining on. So he instructs Phil to lounge on a different chair, Phillip gladly does so, and Rob discovers the clue. Meanwhile Phil snoozes mere feet away, none the wiser. We have to admit, while we despised Rob in earlier seasons, the guy is good. Real good. But the real drama is at Zapatera camp, where Russell and his concubines, Stephanie and Krista, mull their options and make a last-ditch effort to recruit Julie. It’s just impressive that Stephanie had the courage to approach Julie, because that woman is scary. Seriously intimating. Super nice, but a She-Hulk. But Stephanie braves ahead and pleads her case, explaining that Julie would have a better chance of going to the end with an experienced player like Russell, and Julie seems to buy it. And then Russell seals the deal with a fist bump (is Russell also a former federal agent???). With Julie seemingly on board, Russell and his harem feel pretty confident going into Tribal Council, even though they expect the other five tribe members to split their votes between Russell and Stephanie. And Stephanie promptly embarrasses herself by delivering a didactic soliloquy on why it’s a poor strategy to throw a challenge. Her argument may be right – in fact, we agree – but she’s really, really annoying, and it was surprising the entire tribe didn’t agree to vote her out right then and there. Meanwhile, Russell looks like he wants Stephanie to shut up, and Krista might actually be comatose (seriously girl, do you speak?). But even then Russell still thinks he’ll be safe. It’s all under control. 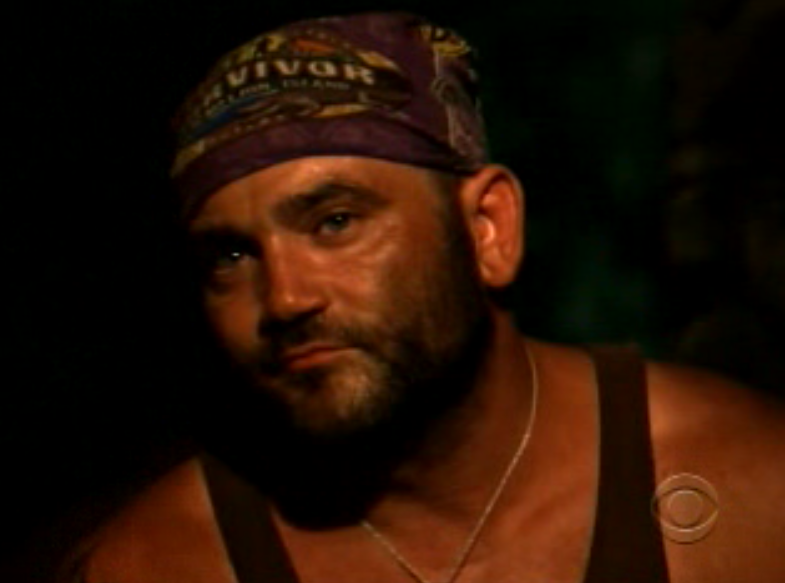 He’s counting on Julie to come through, to flop to his side and deliver what he thinks will be the all-time Survivor blindside. 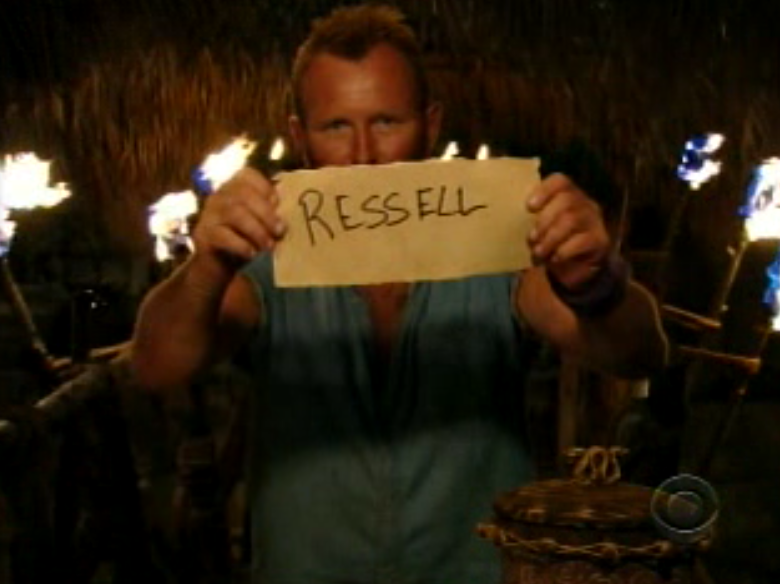 However, that doesn’t happen, and, for the first time in his Survivor history, Russell is voted out. And this is where our above discussion on Occam’s Razor comes into play. It wasn’t hubris that did Russell in (although that surely played its part), it was thinking that Julie would make the smartest move, or at least the move that Russell viewed as the smartest. For all of Russell’s scheming and manipulating he believes in keeping the tribe strong, and he thought he bonded with Julie over that belief. And he was convinced, right or not, that he was capable of leading his alliance to the end, that he was uniquely positioned to do so because of his experience, and he thought Julie would recognize this advantage as well. But you can’t always play assuming that the other player or players will make the most logical or intelligent choice. Sometimes you have to figure they’ll take the ostensibly less rational option, the riskier choice. Because in Survivor, unlike in life, the simplest explanation is not always the likeliest. That’s not Occam’s Razor, that’s Russell’s Razor. BUT Russell’s not done quite yet. He still has at least one more chance on Redemption Island. And until his buff goes up in flames we’re not counting him out. Oh, and Ralph, it’s “Russell,” not “Ressell.” You don’t have to play dumb for the cameras, pardner. – It occurs to us that we should talk a little more about Zapatera’s decision to throw a challenge, and why it was a bad idea. Throwing a challenge almost never works. It’s like making risotto on a cooking show. You think you’re the one person who’s going to get it right. Even though everyone else who tried it fucked up and went home, you think you’re going to be the exception, and the payoff is going to be worth the risk. * Well, guess what, Zapatera, YOU’RE NOT SPECIAL. You only had a two player advantage before taking the dive, which means your edge** over Ometepe is down to one, plus you’ve given them all the momentum, a tarp, beach chairs, a lantern and you’ve created further strife in your own tribe. Doesn’t seem worth it. Not at this point at least. – “We didn’t give 100% but we definitely wanted to win.” Great, completely logical assessment Mike. – We wonder if Kristina is going to be safe now that her idol has been flushed. Certainly, as the numbers presently attest, she’s a lone fox on Ometepe, with even Phillip on Rob’s side. But we wonder, if Ometepe lost the next challenge, would Rob would make the simple, safest move and vote out Kristina or, still having numbers on his side, take out a bigger threat like Andrea.? Might not be a bad decision. Except that we have a feeling that if Kristina somehow made it to the merge she’d quickly fit in with the likes of Steve, David, Mike and Julie (assuming Stephanie hasn’t eaten them by then). Stripped her idol, Kristina might not be dangerous right now, but we’re not so sure she’s made her last big move. No, not for Ralph’s rooster call, but for Russell’s fixed disposition. Certainly, his arrogance turned off his teammates, but even if he did play the game on the straight and narrow, as he pledged he would (and, really, he didn’t stray too far from that promise), the Zapatera tribe would have still engineered his exit first chance they got. Russell could have been as helpful and pleasant as Boston Rob and it wouldn’t have mattered. Those guys made up their minds from minute one that Russell was a cancer that must be cut out. So Russell was right to play the game his way, the way he knows, the way that proved so effective in previous seasons. So, looking back, Russell shouldn’t have any regrets, and he shouldn’t change. Because if we don’t have the same old cocky Russell than we really don’t have Russell at all. Still to come, at some point, our player-by-player odds. But, more importantly, next time on Survivor Russell fights for his life. We think he’ll vanquish Francesca, but how long can he hang in there on Redemption Island? How sharp is his edge? (not sure what that last line means, just really wanted to tie it into the razor motif). *Excluding Top Chef: All-Star‘s Antonia, who, be all accounts, made an absolutely perfect risotto last week. Still, for all you aspiring Top Chef or Survivor players out there, don’t make risotto or throw challenges! **Edge. Like a razor. Nailed It.